Rule of Thirds - Haba Naija! When you see an interesting subject, we usually take our cameras out, point and shoot! The image generally has the main subject in the centre, or very slightly off centre. While often subject-in-the-centre is effective, many professional images follow a rule known as the rule of thirds. The rule of thirds relies on a grid that divides the image into thirds vertically, horizontally and diagonally. 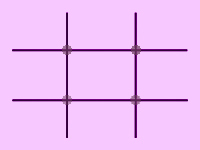 The subject is placed where the lines intersect (marked with purple dots in the image). The purpose of the rule is that the eye is drawn to this point first, rather than the centre. Many professional images, in magazines and on the internet, comply with the rule of thirds. In portrait photography, placing the eyes on one of the points is effective, because the eyes are usually the first place where viewers looks. RULES ARE MADE TO BE BROKEN!! Does this saying hold truth in this case? Yes, it does. Rules dont have to be broken (for extra effect) they can be bent, for example, if your subject is too large, or long to place on the point, it can be placed on the line. It is worth learning composition rules, so that you can break them for extra effect. The Nikon D7100 Announced and Specifications – The D7000 Replacement is Finally Here!